When moving from point A to point B, we know that the task of packing boxes can be long, strenuous and downright annoying! But, unfortunately it is the most important part of moving if you want all of your belongings to arrive in one piece! With all of the hassles of preparing yourself for a move, packing your stuff up the right way can get lost in the shuffle of things to focus on during the move. But don’t let it; it’s too important! If you choose to pack your household items yourself, let us give you a some tips on how to properly pack your belongings and protect your glassware when moving. You’ll thank us later! Wrapping – Don’t let the kids pop all that bubble wrap, you’re going to need some! Make sure that all of your fragile belongings are wrapped tightly in at least 2-3 layers of bubble wrap or newspaper so that it can withstand any bumps during the trip. Anything from glassware, ceramics, figurines, or other delicate objects need to be wrapped. If not, you may find a very unpleasant surprise when opening your boxes at your new home. Boxing – It may not seem like a big thing, but using durable boxes of the right size plays a huge role in the packing process. The first thing to do is to avoid flimsy boxes at all costs. A sturdy box that provides two inches of space around your items is important to protect against spillage and breakage. And of course eliminate the disaster of having the bottom of your box magically open up! Once you have the right box, be sure to fill it with crumpled up newspaper and/or packing peanuts so that the glassware and fragile items placed into the box don’t shift around at all. Do not pack the box with too much weight. When it comes to pounds, ten is the magic number. If you pack any more weight into a box it can become too heavy to move, and naturally you’ll want to stack other boxes on top of those heavy ones, which can be dangerous if that box contains dishes or chinaware. The double-boxing method is also something to think about. Double-layered walls will protect against damage and can be a safe way to transport expensive or fragile items. Once everything is packed, be sure to seal the top and bottom openings of the box with packing tape. 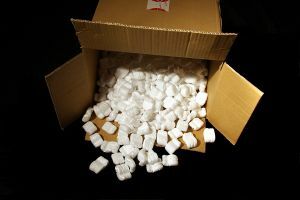 Placing – Positioning your items on to the center of the packing peanuts is a good way to ensure that they absorb all the cushioning necessary to keep safe. You’ll want to stuff that box full of newspaper and peanuts to prevent your items from shifting and possible breaking. Not sure if you’ve done a good enough job? Do the shake test! If anything is wiggling around in there, make sure the contents are completely locked in by the peanuts or paper by the time you the seal the box and send it on its way. If you are in need of packing supplies, be sure to check out our recently reduced pricing on boxes and packing supplies. Also don’t forget to inquire with our representative about free delivery on all boxes and supplies. If you have any more questions contact Men on the Move and one of our moving experts can lend you a hand. If you’re looking for a moving quote, how does a free one sound? We provide free quotes for residential and commercial moves! Happy trails and have a safe pack!